The holiday season is upon us! Families will be hitting the road to celebrate Thanksgiving, Christmas, and New Years with friends and loved ones. Unfortunately, these joyful occasions can be ruined by the attendance of those with whom we vehemently disagrees, or just dislike. 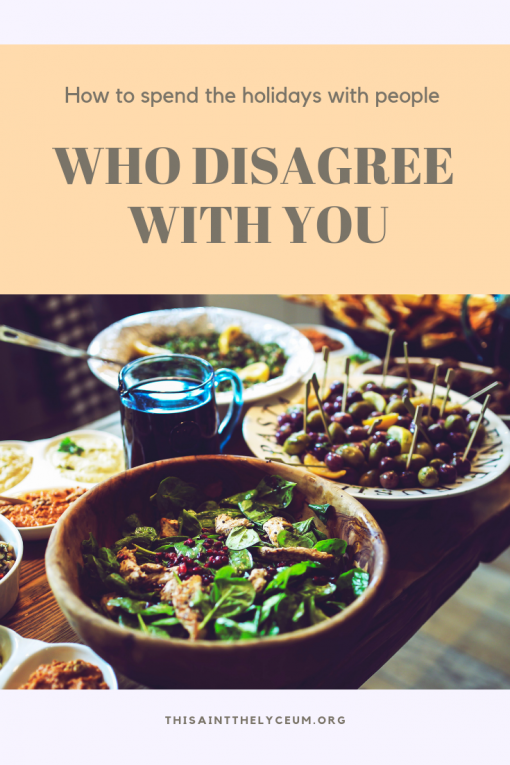 Feasting, and the sharing of memories and gifts can be overshadowed by rude or condescending comments, the inability to let a contentious topic drop, or a complete detachment from logic and reason. But what to do???? Do we abandon long-held traditions? Do we stay silent in order to keep the peace? How can we maintain family bonds while not bringing undue hostility and discord into our celebrations? NEVER FEAR! I offend friends and family all the time at holiday gatherings, so I of course know all the steps to take to avoid and diffuse confrontation so that Thanksgiving can stay focused on giving thanks, Christmas can stay focused on Jesus’ birthday, and New Year’s Eve can remain a time of drinking and regret (without any compounding family drama). 1. So your great-uncle wants to discuss the state of your soul, and how your choice of religious belief is either a) the whore of Babylon or b) the result of brainwashing. The simplest response is nothing at all. We don’t have to engage or say anything. In fact, I recommend making and wearing a button that says “I am suffering from selective laryngitis.” You can talk to anyone you want, while persistent nags will find your vocal cords unresponsive and unsatisfactorily silent. So your cousin’s boyfriend wants just one good reason why you voted for that guy in the local school board election? Just cough, point to your button, rub your throat, smile and walk away. 2. People who berate and belittle others, and are unable to hold a logical discussion on differences of opinion really speak more to their own character than yours. So what if you’re the only one in the room who does not subscribe to flat earth theory? If you’re the only one who can remain calm, enjoy your food and drink, and provide ample evidence to support your opinion, you should be able to sleep well at night without guilt tugging at your conscience. Don’t feed the fire with your own emotions, as tempting as it may be. Blessed are the peacemakers, the meek, the merciful, and the persecuted; not the arrogant blowhards, or even the witty, the clever, and the better educated. 5. The most difficult arguments are with those who hold crazy conspiracy theories. No matter how much evidence you present to the contrary, there is always a reason why their outlandish beliefs are more plausible. Going forward, I now skip over logic and reason and go right to absurdity. 6. In every argument, it helps to look for the common ground. God, no God, we can both still agree that white chocolate isn’t really chocolate and actually gives all chocolate a bad name right? Bond over your shared beliefs rather than focus on where you differ. There is objective truth, all truth is subjective; can’t we both agree that these socks are slimming for my ankles? Let’s share a toast to that! 7. When all else fails, imagine that your family gathering is purgatory. Everyone is uncomfortable and would prefer to be at home, but you all know you must endure this painful time together before returning from whence you came. Now you can anticipate each holiday like it is a spiritual retreat designed to purify and cleanse your soul (imagine that especially irritating family member is just a holy pad of Brillo! )… so long as you remember to offer up each instance of pain and suffering. When a cutting remark is directed at you, smile, bite your tongue and know that discomfort you feel is nothing like the hellfire you could experience if you take the bait and then later rehash the whole thing on Facebook in passive aggressive GIFs. What advice would you offer for difficult family gatherings? Write it down then link it up below. Be sure to include a link back to this post so your readers can find the rest of the Quick Takes. I look forward to reading your posts! You’re amazing. I just cry-laughed while reading this, and I’m not even expecting any conflict! Happy Thanksgiving, Kelly! This is a fabulous resource. Must share with #allthefamily!